Compact, biodiverse and frankly bursting with wildlife, Costa Rica is a country that lends itself to outdoor adventure – and that’s before we’ve even touched upon the smoking volcanoes, misty cloud forests and lush rainforests. With 30% of the country’s land protected by national parks and nature reserves (there are over 26 of them), Costa Rica offers an excellent variety of well-marked and lesser-known trails, from gentle coastal walks to challenging mountain climbs. Open daily from 8am-3pm for hikers, Arenal National Park spans 12,080 hectares and affords showstopping views of the magnificent Arenal Volcano. From zipline tours to white water rafting and mountain biking to hanging bridges, this is Costa Rica’s adventure hub and the ultimate destination to experience all the activities the country is most famous for. But enough of that; we’re here to talk about the hiking – and trust us, you’re in for a treat! 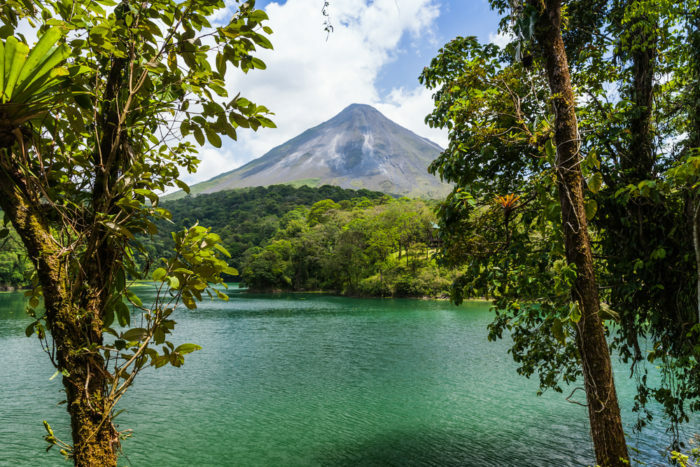 There are a number of well-marked hiking trails in the park through a variety of ecosystems – which means one minute you’ll be strolling through tropical rainforest with colourful orchids and soft green ferns, only to venture around the corner and find yourself up close and personal with Arenal volcano itself. The wildlife is pretty impressive here too, from bird life (most of Costa Rica’s 850 species of bird can be found here, including the endangered quetzal) to white-faced monkeys, jaguar, coati and toucans. 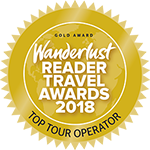 But it’s not all about Arenal – the lesser-known dormant Cerro Chato Volcano sits unassumingly next to Arenal and offers a fantastic hiking route through tropical rainforests and old lava beds to a sparkling emerald green lake in an extinct crater – in fact, it’s one of our favourite trails. The Rio Celeste hike in Tenorio Volcano National Park has got to be one of the most magical sights in Costa Rica. The seven-kilometre walk is mostly on flatlands, so it’s not too difficult – but this one isn’t about challenging yourself; it’s about taking in the views as you walk along a river so blue it almost seems unreal. Setting out from the gates of the Tenorio Volcano National Park, you’ll venture through thick primary rainforest, past loudly chattering monkeys to the banks of the other-worldly Rio Celeste. As you follow the river upstream to the source of its extraordinary colour, the confluence of the Buena Vista and Roble rivers, the colour of the river deepens. Sulphur and carbonate from the Tenorio Volcano is responsible for turning the river an unnatural shade of blue, which, set against the bright green of the rainforest, looks as if it is luminous. In fact, it’s so blue it looks photoshopped – trust us when we say it needs to be seen it be believed! 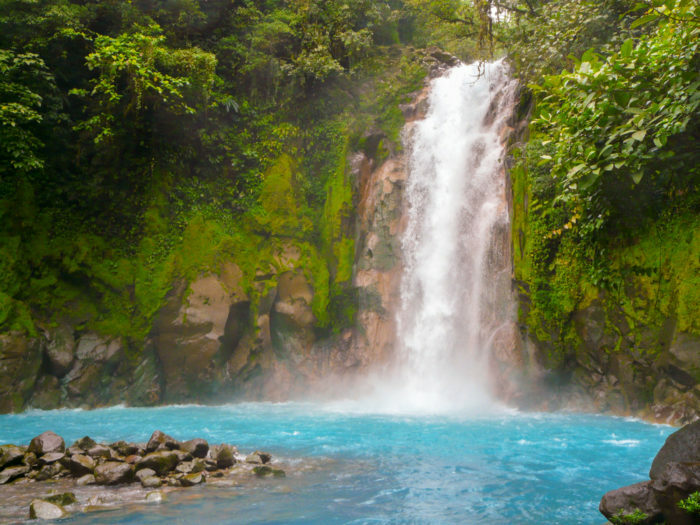 Once you’re done ogling at the bright blue waters, one of our favourite Costa Rica travel tips is to end your hike with a dip in the natural hot springs around Tenorio Volcano and soak your aching limbs – utter perfection! 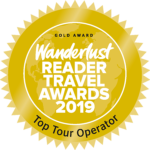 Created in 1972, the 4,000-hectare Monteverde Cloud Forest Reserve is one of the oldest and most famous in Costa Rica – and is also one of the last tropical cloud forests in the world. Straddling the continental divide between the country’s Pacific and Caribbean halves, there are six different life zones, each with a slightly different ecosystem. Yes, it’s well visited – but it also offers one of Costa Rica’s best opportunities to see a wide variety of cloud forest birds and mammals. 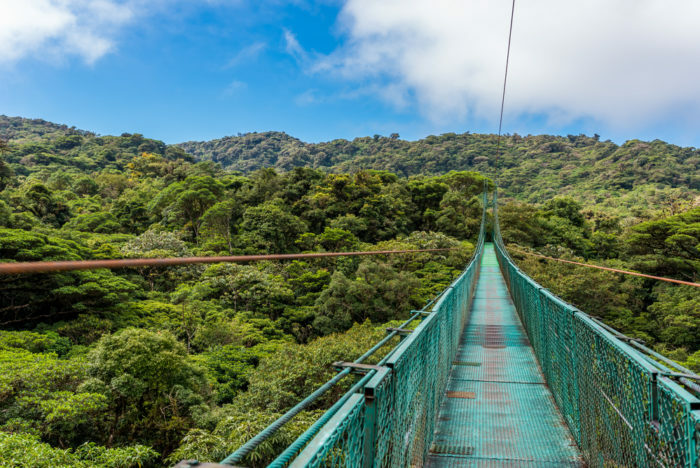 You can unleash your inner Tarzan as you swing through an exciting zip lining tour, or roam through the treetops on canopy walkways as you take in the unbeatable views of the cloud forest and wildlife below – and the hiking opportunities here are exceptional too. The reserve is crisscrossed with 10 different trails, each giving a unique perspective on the reserve’s biodiversity. Sendero Bosque Nuboso, the Cloud Forest Trail, is the most popular and arguably the prettiest with misty forest, whilst the Sendero Pantanoso (Swamp Trail) will take you through a swamp forest to a viewpoint of the Continental Divide. There’s also Sendero Chomogo, the highest trail on the reserve, and the Sky Walk, which will take you over all five of the reserve’s suspended bridges. Look out for over 400 bird species, tens of thousands of insect species, more than 2,500 plants, and 130 mammal species. If you get the chance, make sure you head back to the reserve after dark for a night walk to discover the secret nocturnal life of the forest as you venture along trails in search of coatis, fireflies, tree frogs and poison dart frogs, as well as bats and lizards – it’s a truly unforgettable experience. 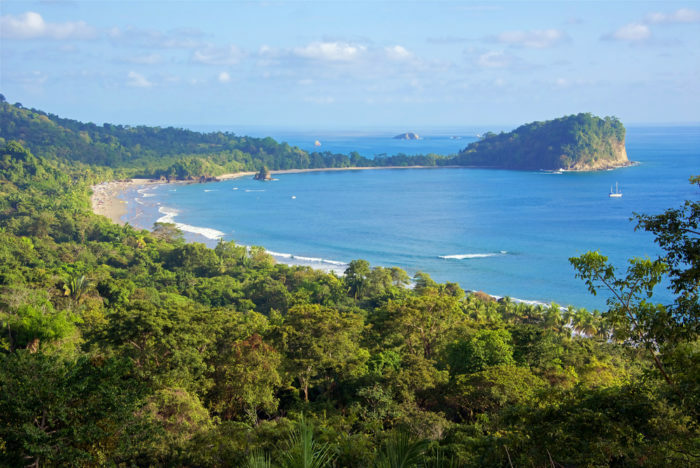 Manuel Antonio might be one of Costa Rica’s smaller national parks, but it crams a lot into its 1,983 hectares. In fact, it’s been named as one of the best parks in the world – and set on the central Pacific coast, here you’ll find everything from rugged rainforest to white sand beaches and colourful coral reefs. Activities here include excursions in the mangroves as you look for sloths, capuchin monkeys and waterfowl, before relaxing on soft sand beaches. You can also kayak, fish, and snorkel too – and because the park isn’t that big, you can hike the whole thing in a day! There are a number of trails dotted throughout the park leading from the jungle-fringed beaches right up into the towering mountains. For a gentle route, try the Main Trail from the park entrance which follows a flat, sandy track and branches off to all the major beaches within the park. It’s a great place to spot three-toed sloths, white-faced capuchins and numerous colourful birds as they dart in and out of the trees. If you’re after a more challenging route, then the Cathedral Point Trail is for you: a 0.9-mile loop around the park’s ridge, there’s a number of incredible views- and because the trail begins and ends near the Manuel Antonio and Escondido Sur beaches, you can stroll down and enjoy a relaxing dip after your strenuous climb – just don’t forget your swimsuit! In the far south-east of Costa Rica, the Osa Peninsula is quite simply the best place to see wildlife. Blanketed in dense rainforest, this remote crop of land that juts out into the Pacific Ocean houses some of the best and most intense biodiversity in Central America. 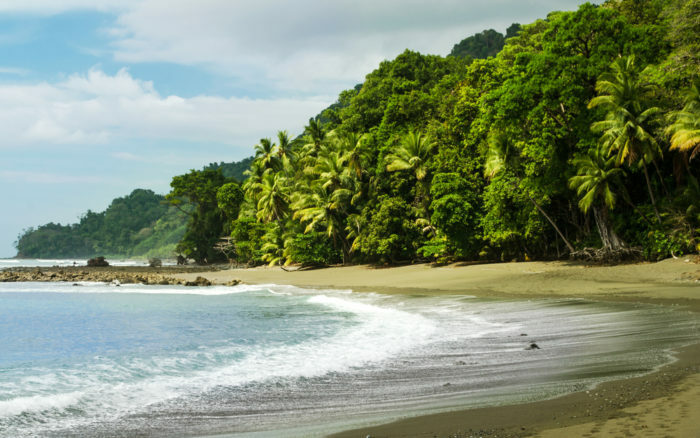 Within the Peninsula, you’ll find Corcovado National Park, which arguably has the best hiking trails because you get to experience what Costa Rica is most famous for – the wildlife. The park has a good network of trails, each venturing deep into the dense lowland rainforest. Whilst the hiking here is the most strenuous in Costa Rica, following both coastal and inland routes and passing by habitats ranging from Pacific beaches and mangrove swamps to lowland and montane rainforests, it’s more than worth it. In fact, it’s been named by National Geographic as the most biologically intense place on the planet and protects around 5% of the world’s biodiversity. It contains a whopping 13 diverse ecosystems and is home to a large number of endangered species such as jaguars, red-backed squirrel monkeys, Baird’s tapirs and harpy eagles – and due to the park’s remote location in Corcovado, monkeys and macaws greatly outnumber humans. Exploring the jungle throughout the Peninsula provides plenty of opportunities to spot all four of Costa Rica’s species of monkey and two-toed sloths as you look out for other animals such as anteaters and tayras, reptiles and unusual insects, as well as the highest diversity of flora and fauna in the entire country. An insulated water bottle – the best thing in the world when you’ve been hiking under the hot sun all day! Our top Costa Rica travel tip? Make sure you take at least two litres with you! A microfibre towel – wipe the sweat off your face, cover yourself in the rain, brush away sand, or dry off after a dip in the thermal springs – trust us, you don’t want to leave home without one of these! 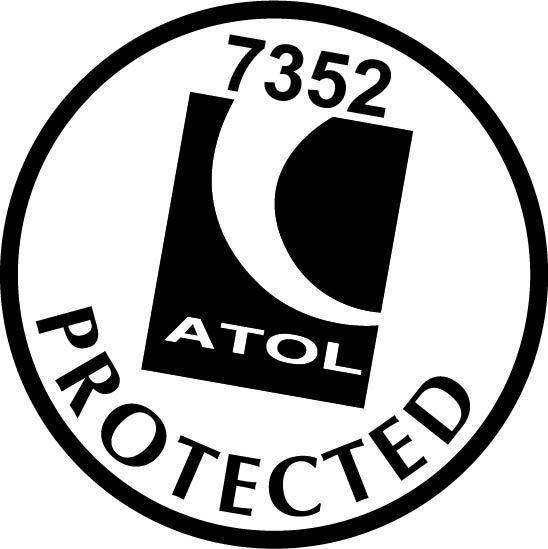 Mosquito repellent – mosquitoes are found all over Costa Rica apart from in the high elevations. Mozzie repellent is a must, especially for jungle hikes in Manuel Antonio and Corcovado. Hiking shoes – the right footwear is an absolute must. Whilst closed or open-toed hiking sandals are generally ok for Manuel Antonio, Rio Celeste and Arenal, for Monteverde, we’d recommend proper hiking boots – so make sure you pack accordingly. 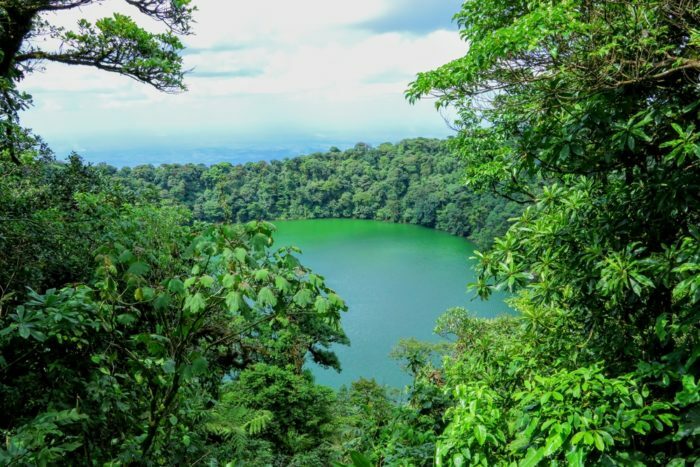 In conclusion, from gentle trails to strenuous hikes, through rainforest, cloud forest and jungle to jewel-coloured lakes and mystical waterfalls, there’s no doubt about it – Costa Rica is one of the best places in the world for hiking. Ready to start planning your trip? 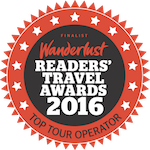 Our Costa Rica expert Dawn has the best Costa Rica travel tips and inside knowledge and is on hand to help you to create the tailor-made trip of your dreams. Contact Dawn and our Costa Rica team to get a quote today!